We are seriously looking to start carrying a very good selection of Olive Oils, Vinegars, Jam's, Jellies, Chocolate, Sauces, Mixes Etc... Basically, to sum up - Specialty gourmet consumables. We would love your input on what you would like to see here in our store. If there are products that you love and can't get easily other places please let us know. We are looking to do quite extensive research and would love to get our customers input. Please let us know. E-mail us: info@fykitchen.com Post your response in Facebook: https://www.facebook.com/For.Your.Kitchen Call us: 801-866-1111 or Come on in and tell us: 772 E. 700 S. Clearfield, UT 84015 (Just 3 Blocks West of I-15 Exit 334). Located @ 772 East 700 South Clearfield, Utah 84015 (3 blocks West off I-15 Exit 334). 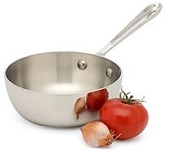 For Your Kitchen is a Gourmet Kitchen Store focused on quality kitchen products that make cooking more fun. We belong to ITEX a trade organization. If you a business and have items / services that you would like to trade click on the banner to the left and give ITEX some consideration. May 2012 - We have had a great response since we have moved to our new location. To all of our customers, Thank You! We are still doing a lot of housekeeping and assume that we will for the foreseeable future. We are doing the best that we can and we are grateful by how quickly we have been able to see you find us and take advantage of our Cooking Classes, Knife Sharpening Services, and all our our Cooking Products. We recently have added a lot of cake and candymaking supplies, many of our customers have had to go to Salt Lake to find these items in the past. We hope that we can help those in Weber and Davis counties to be able to find these quality products more easily in the future. We have added many Cooking Classes and have seen a great response to our classes so far in the New Location here in Clearfield, UT. We feel that our close proximity to I-15 has really helped since every attendee to our classes is coming here specifically and being close to I-15 allows our customers to more easily get to our store. We invite you to attend one of our classes in the near future we have a lot of fun and we are sure you will too. Please also think of us and our private cooking classes when you want to plan a special event or even for a company teambuilding excersize. We have more and more private cooking classes and still feel that the word is not out about these. Thanks again for all the support from our customers! October 2011 - "For Your Kitchen" just celebrated 7 years in business! Thanks to all of our loyal employees and customers who have helped us to make it through the hardest part of business (the first few years and economic recessions). 2009 Best of Ogden Award - For Your Kitchen has been awarded "Best of Ogden" for the second year in a row and we are very pleased that our small efforts that we have made have payed off. We at For Your Kitchen know that we can do better and we are working hard to get better at giving good service, knowing our product & generally helping in any way that we can. We feel very blessed with how patient and loyal our customers are. We have seen many of our peers (some of them very experienced) discontinue their operations in the last two years due to the current economic environment. We attribute our small success to our effort to give great service to our customers. We commit to give the best service that we can, we realize that at the same time that if we could afford more staff members, products, and equipment we could offer a better overall experience. Some of these may have to come with time, Thanks again for your support for our business. Here is an excerpt from the article awarding us "Best of Ogden 2009": "Each year, the US Commerce Association (USCA) identifies companies that we believe have achieved exceptional marketing success in their local community and business category. These are local companies that enhance the positive image of small business through service to their customers and community." Kuhn Rikon 2009 Specialty Retailer of the Year Award - For Your Kitchen just recieved the 2009 Specialty Retailer of the Year Award from Kuhn Rikon, the manufacturer of the best pressure cooker on the market. The award states: "In Recognition of Outstanding Sales Through Quality, Commitment and Partnership". I am very excited to have recieved the award. My first experience with pressure cookers began about 6 years ago and the Kuhn Rikon Pressure Cooker changed my cooking world! This (the Kuhn Rikon brand of Pressure Cookers) is my #3 tool for the kitchen. If you would like to know why please come to my next pressure cooking class. To find out more about Kuhn Rikon pressure cookers click here. Don't be decieved by cheap imitations, if you experience a Kuhn Rikon you will never go back! "For Your Kitchen" sells and loves many quality kitchen tools and appliances but where we really shine is in mixers and grain mills. If you have never been, then you need to come to one of our cooking classes located in our demonstration kitchen at the west end of our store. We teach whole grain bread making while using many different grains to enhance flavor and health. We are excited and passionate about what we love and the Bosch Mixer is the best we have ever used, and we have used various types of mixers, we also love the Nutrimill for grinding grains into flour. We use what we sell and we teach others to use what they buy and we believe that makes a happy customer! We also feel that in the current economy these are products that make dollars and sense. To make a loaf of bread would cost $.40 as opposed to a purchased loaf at $4 (click here to see our bread recipe ). We know that you can eat better tasting food that is better for you and save a lot of money by cooking at home and who doesn't want that? Take a look at our current Cooking Classes. These are very economical and you get to eat! Thanks for taking a look today and we hope you will be back frequently and often. All-Clad Cookware, Bosch Mixer, Capresso, Cuisinart, Kershaw Cutlery, KamadoJoe, Kitchen Aid, Kuhn Rikon, Le Creuset Cookware, L'equip, Libertyware, Lodge, Nordic Ware, OXO, RSVP, Signature, Soda Stream, Swiss Diamond, Traeger Grills, Waring Pro, Wusthof Knives, Viking, Zyliss & Many More!!! For Your Kitchen also offers service such as: Bridal & Gift Registry, Cooking Classes, Gift Wrapping, Gift Certificates, Gift Wrapping, Knife Sharpening, Layaway, Online/Phone Shopping and Shipping. "For Your Kitchen" is an Authorized Bosch Kitchen Retailer! What is a Bosch Kitchen Center? 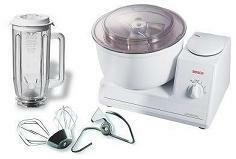 A Bosch Kitchen Center is simply a kitchenwares retailer who focuses on Bosch Kitchen Mixers. We (For Your Kitchen) think that simply selling the machine is not really a Bosch Kitchen Center we believe that it goes beyond simply having the item for sale. We work hard to become farmiliar with the Bosch Kitchen Machines, not only the mixer itself which has four series of mixers: Bosch Universal Mixers (UM3, MUM6***, MUM6N**), Bosch Compact Mixer (MUM4***), Bosch Concept Mixer (MUM7***) **Now Discontinued, and the MUM8 Series which is only available in europe. We also believe that we should be intimately familiar with the Bosch Kitchen Machine by using the various mixers and attachments. The most integral part to what we believe that it is to be a Bosch Kitchen Center is to use the Bosch Stand Mixer in our cooking classes so that others can experience how easy and amazing this Kitchen Mixer really is! Widely known as the best bread mixer available we believe that the Bosch Bread Mixer is great for making everything you might with your more traditional mixers and more! We mash potatoes, whip frosting, whip meringue, whip cream, mix cakes, cookies, batters of all sorts i.e. pancakes, waffles, brownies, shred chicken (this is amazing!) pastry dough such as pie crust and much more! I love the name the Bosch Universal Mixer went by in the 70's - Bosch Magic Mixer, because to me this mixer is magic!